Having a Wireless Charging Mouse Pad is more than convenience as you could have your smartphone or any other Qi-compatible devices charged without wires or cables. But what if you could have a wireless charger that could do more than just charging? 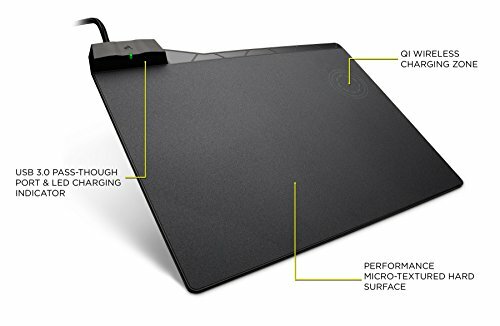 Quite recently, there are manufacturers that considered adding wireless chargers into mouse pads and they work like a charm. Imagine using your wireless charger while it’s beside your computer, sitting right next to your mouse where you always see it. Because this kind of technology is all the comfort and convenience it can provide to consumers, especially those who frequently find themselves next to their computers, there are now various brands and models in the market. With this list of the best wireless charging mouse pads in 2019, we hope that you could find the mouse pad that fits both your style and level of comfort. The problem with conventional Qi wireless charging pads is the fact that it only accommodates devices that are Qi-enabled. Meaning, if it’s a different device altogether, such as non-flagship smartphones or other devices off the Qi list, then these kinds of convenient chargers are nothing but props. However, Corsair would like to change that perception by creating a wireless charging mouse pad that not only provides control to their wireless mice, but also comfort to anyone who wanted to experience wireless charging. The Corsiar MM1000 Qi Wireless Charging Mouse Pad is an excellent choice for a high-quality mouse pad that supports wireless charging. For one, you could charge any Qi device, whether it’s an Android, an iPhone, or anything else in between. Just like the pad version, you just enable Qi in your device settings, in case it’s available, and just lay your device down. In the MM1000, however, it’s a little different. You need to place your device on the charging symbol found on the upper right section of the mouse pad. The fun part is the included Qi charging adapter that can be inserted to a mini USB port, a Lightning port, or a USB-C port. Imagine charging any device wirelessly on the Corsair mouse pad, even when it’s not Qi compatible. And the wireless charging mouse pad is not just created for Qi charging with smartphones or other gadgets. Corsair made sure that their wireless gaming mouse, the Dark Core RGB SE, could also take advantage of the neat technology. 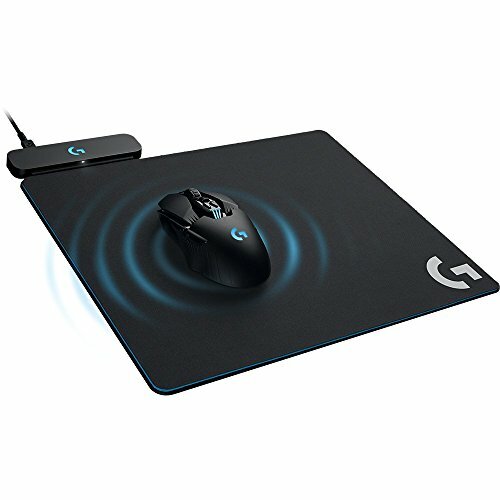 Carrying its mandate for revolutionizing gaming, the Logitech G Powerplay Wireless Charging System is set to solve problematic and inconsistent input device issues by deploying their powerful wireless mouse that consistently provides charging the gaming mouse through the mouse pad. You will no longer go back to the era when the wireless mouse slows down due to a depleted battery. 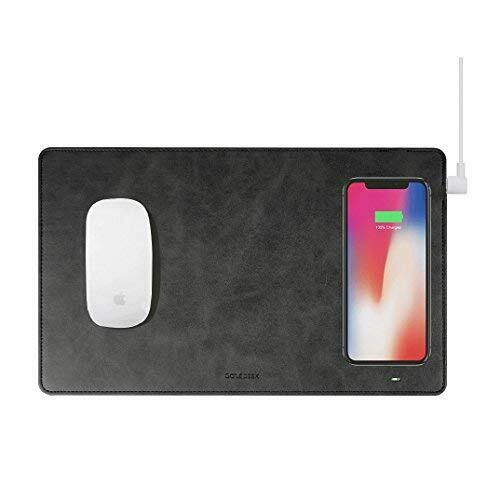 Although the mouse pad provides wireless charging like any other brand out there, what sets the Powerplay system apart is its use of electromagnetic resonance. Through this technology, the charging area is exponentially increased, unlike older models that only provide charging on a limited area, usually as big as a smartphone’s width. What makes this technology work is a module in the compatible gaming mouse that transforms the electromagnetic field into a charging current. In addition to Powerplay, Logitech also innovated Lightspeed to address the connectivity of the gaming mouse by placing a receiver at the upper left corner of the mouse pad. This does not only enable the pad to be charged for the technology to work, but it also assures that the wireless mouse would be constantly connected to a receiver that’s not just closer, but also more dedicated and integrated. Due to advanced engineering embedded within the system, from the sensors to the antenna, Logitech was able to achieve a 1ms wireless transmission transfer; a feat only possible through a wired setup. Despite the fact that the charging system is only applicable to Logitech’s gaming mice, considering that the mouse will always be powered for life, it’s a technology that’s worth the purchase, especially if you’re a gamer that’s looking for speed, without the limitation of wires or cables. 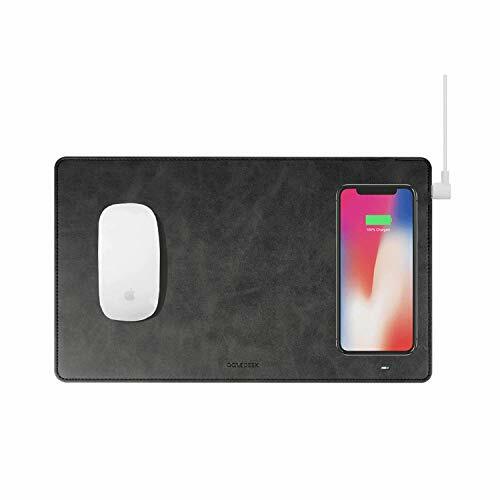 When you’re into looking for a mouse pad that looks classy, apart from the usual black-colored mat, the Zofine Wireless Charging Mouse Pad is more than a considerable option. With the whole pad made of polyurethane leather, it’s more than just giving that luxurious look that invites you to use your mouse pad more. The material used makes it possible for the pad to be resistant from dust and water – features that you’ll appreciate especially if you’re into keeping your pad clean and mess-free. If you have high-speed charging capable smartphones, like those of Samsung or Huawei, to name some of them, you’ll be delighted by the fact that the wireless charging mouse pad can generate up to 10W of Qi from the panel inside the mouse pad to the device. The charging performance can be compared to that of wired charges, as 10W is very demanding, especially for wireless Qi. This removes the need of using cables or wires that are inconvenient, if not troublesome at times. 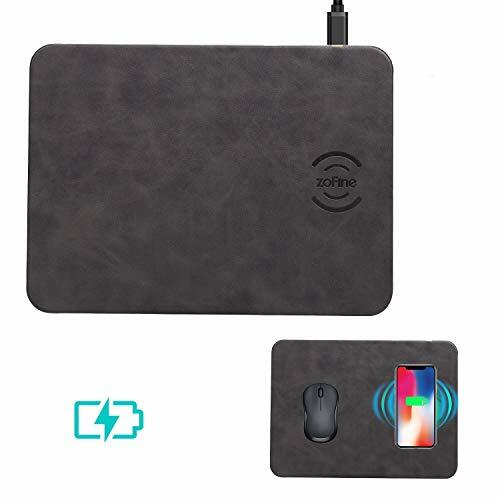 When it comes to safety and reliability, Zofine’s Wireless Charging Mouse Pad is supported by a non-slip base that significantly avoids accidents due to unconscious usage. There is also protection for power surge, temperature spikes, short-circuit problems, and even in voltage incompatibility. Your mouse pad, along with any charged device, is protected and safe at all times. Charging fast does not need to be inconvenient and limited as the GazePad Qi Wireless Fast Charging Mouse Pad provides you the power to juice up your Qi-compatible device by simply placing it on the “G” located on the right-hand side of your pad. There’s also much to anticipate with the charging speed of the pad as it has 3 charging coils in place, instead of the usual 1 coil that does charge, but not as satisfying. At the same time, the charging zone is also larger, excellent for those who unconsciously place their phones to charge. The size of the mouse pad is also notable, being at 14.1 inches by 8.6 inches. To have a feel of how the mouse pad should fit in your workstation, placing a legal-sized paper could comfortably sit in your mouse, your smartphone, or you could place something bigger, such as a tablet, for Qi charging. Move your mouse or charge your stuff with style and convenience with a polyurethane leather surface that keeps your stuff safe from skidding or slipping on the mouse pad. Moreover, you could choose your shade whether it’s black, grey, brown, or midnight blue. You could also find that there are two USB-C slots located on the right-hand side, and on the upper right corner. These are placed to suit your setup, whether you are having your adapter horizontally or vertically adjacent to your mouse pad. Many of the wireless charging pads offer design that’s immersive and inconspicuous, making the charging section of the mouse pad a little confusing to some. However, the Ricov Qi-Certified Wireless Charging Pad has addressed that issue by actually separating the pad and the charging panel in one same body. The distinction of these two sections are clear thanks to the difference of materials used for the charging panel and the mouse pad, making things obvious even for the unfamiliar with the technology. The wireless charging pad produces power at 5V and 1000mA, more than enough to provide a decent amount of juice for high end smartphones like the iPhone X, Samsung S8, Google Nexus 6, the HTC 8X, and others that are Qi-capable. With one of the sides being polyurethane and another being toughened glass, you’ll feel the craftsmanship in the manufactured mouse pad. In fact, Ricov provides guarantees to buyers that their product is a performer that can meet customer expectations. While most gamers are into investing with gear that enhances performance, there are others that would like to make the most of that said purchase by getting bundle deals or considering value that affects everything on a large-scale benefit. 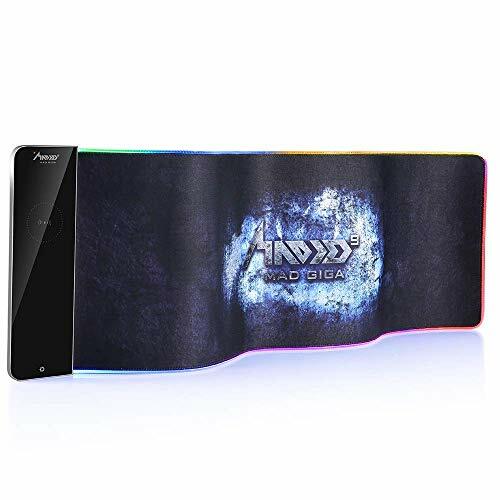 Imagine getting an RGB gaming mouse pad that can charge your smartphone or Qi-capable device, while giving you the edge in your game. That’s where the Redragon P025 Wireless Charging RGB Backlit Mouse Pad excels in doing. Though there’s the RGB lighting already lit upon use, it can be surprising that the wireless charging pad can generate 10W, which is excellent for charging high-end smartphones. 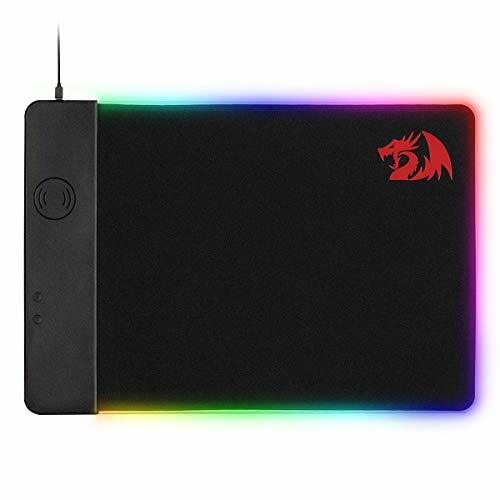 To make sure that you’re confident from having your phone and mouse pad from possible current damage, Redragon deployed protection from over-current, over-voltage, and over-temperature. But one of the best features you’ll get is that you don’t need to install software to configure the RGB lights with the mouse pad. With buttons located on the charging plate, where you could choose over 7 shades and glowing modes, you’ll experience how it feels like to be a gamer without spending much. With a smooth surface and stable rubber base, you know you got one heck of a wireless charging mouse pad. If you’re a mad gamer and you’re never satisfied with short mouse pads that does not keep up with your mode of game, then the Mad Giga Wireless Mouse Pad Charger is worth checking out. With a mouse pad that’s 3 times longer, you’ll have more than enough pad space, especially for systems that involve long displays and heavy levels of interaction. But the mouse pad is not just for game. You could also charge your Qi-capable smartphones and other devices on the charging plate located on the left side of the pad. Though it charges like anything else, with 5W, 7.5W, or 10W for your smartphones and other gadgets with Qi support, what’s peculiar is the manufacturer’s confidence in letting you keep your cases in place. 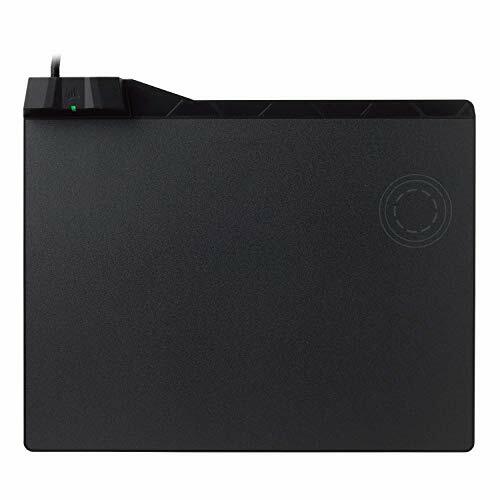 Other wireless charging mouse pads have limited charging power that mobile phone cases need to be removed before having it placed on the panel. So even if you have a very thick case, even 6mm thick, Mad Giga confirms that charging would still be done without flaw. There are also 11 lighting modes controlled through the button located on the bottom section of the charging panel. You could choose between 7 shades and have them on static, or you could also choose between breathing and rolling LED modes. The quality of the mouse pad is also meticulously manufactured, choosing ultra-fine fiber in order for the mouse to experience less drag, more flow, and smoother navigation feel. The base is also dependable with its rubber matting, which helps avoid slipping from any surface the mouse pad is on. Which mouse pad stands out? While of the items in this list provide wireless charging as it should, some of the things you could consider is the capability of the charging panel to still accommodate your device without the need of inconveniently removing the case. After all, with the technology offering convenience without the binding cables, the level of comfort should be maximized all the way. As for the dynamics with how the charging panel is based, it’s simpler and nicer if there’s a distinct section where you could obviously place your device for wireless charging. With less time to worry about your phone and more on your life in front of the computer, you’ll be able to place your Qi-capable device even by a glance; unlike with a modest and non-invasive design. For other features, RGB lights would be great if your mouse pad is for gaming. Otherwise, the polyurethane leather skins should be more than decent. And with consideration to safety, look for a wireless charging mouse pad that has protection from possible accidents due to voltage, charging, and sudden power surge.